Recover faster & get back to being you. We’re committed to helping you navigate the road to recovery, whether it’s related to a planned procedure or unexpected medical change. Specializing in therapy for older adults, we’re equipped to handle a variety of rehabilitative needs, including post-surgery, a fall-recovery scenario, prior to a planned procedure, or to continue a relationship built with a therapist during an Short-Term Rehab stay. 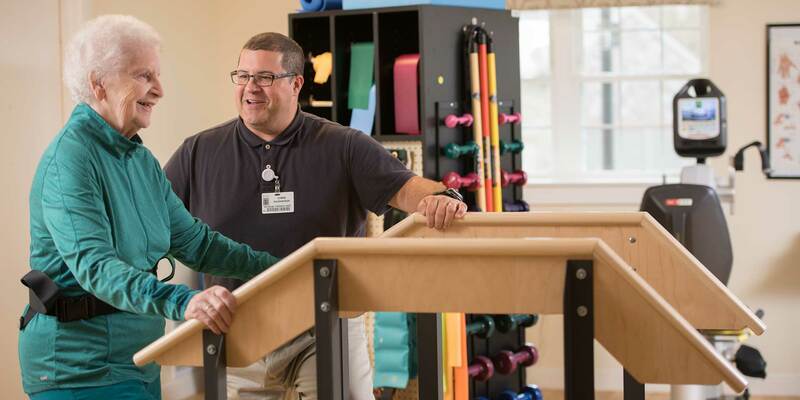 Our skilled occupational, speech, physical and respiratory therapists provide treatment programs for a variety of physical and medical diagnoses, including falls, pain management, joint replacements, gait training, balance issues, urinary incontinence, and low vision. Prior to any assessment or treatment, we will review your care options and verify insurance eligibility coverage and potential member responsibility fees for outpatient therapy services.